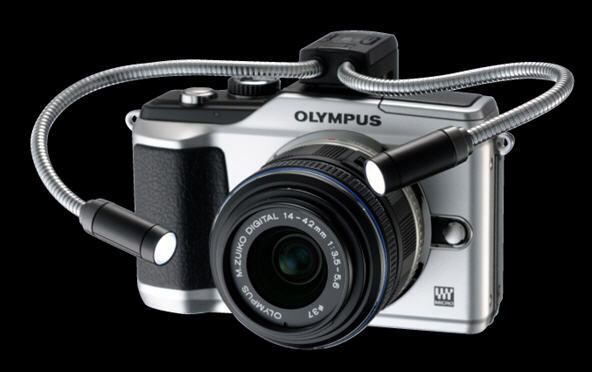 Olympus introduced the Pen E-PL1 (PL stands for Pen Lite) almost a year ago to bring the Pen compact system camera or 'hybrid' to a wider audience, incorporating ease of use enhancements in a smaller, lighter, lower specification, and more affordable body. The new E-PL2 is designed to build on the strengths of the E-PL1, while restoring some of the specification lost when the E-PL1 was conceived and to apply some of the style of the original Pen E-P1 and E-P2 models. At the same time, Olympus has replaced the original m.Zuiko 14-42mm kit lens with a smaller, lighter, and more refined Mark II version. Although optically good and innovatively designed, the original m.Zuiko 14-42mm kit lens was criticised for slow autofocus and noisy focus action that spoiled the audio quality of movie recordings. Olympus has totally redesigned the lens and the result is a Mark II 14-42mm kit lens that is lighter and smaller (if slightly longer) and has a much quieter autofocus mechanism. Like the 9-18 mm, 14-150mm, and 40-150mm m.Zuiko lenses, the 14-42 II now has near-silent AF and smoother AF transitions during movie recordings . Olympus data suggests that the AF is also twice as fast as the original 14-42 kit lens. Unlike its predecessor it focuses internally, which means a non-rotating lens hood can be accommodated, along with add-on wide angle, close-up, and telephoto conversion lenses. The new lens no longer employs any ED glass, but three aspherical elements compensate. 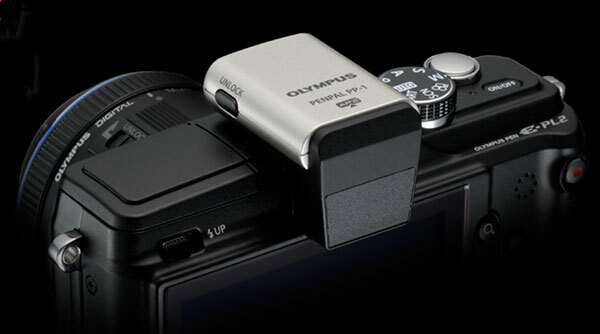 An enhanced Accessory Port has been introduced with the E-PL2. It's backwards compatible with the VF-2 1.4m dot electronic finder and SEMA-1 stereo microphone adapter modules, but now features a communications protocol that can support devices like Bluetooth modules. Olympus is planning to release the Pen Pal PP-1 Bluetooth module that will enable image sharing with other Bluetooth devices, like smartphones. Compatible with both Accessory Port 1 and Accessory Port 2 interfaces, Olympus is also going to offer a Macro Arm Light (MAL-1) (below) that provides LED illumination of macro subjects via two flexible arms powered via the Accessory Port. The sepia art filter from the E-PL1 has been replaced by the Dramatic Tone filter first introduced in the Olympus E-5 DSLR. In addition, some filters now have on or two variation options, and a new frame feature can be combined with some art filters if required. 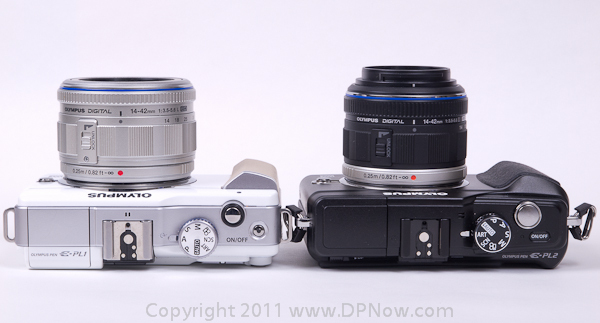 The original Pen E-P1 and E-P2 had 3 inch screens but the E-PL2 went back to the smaller and cheaper 2.7 inch size. The new E-PL2 returns to the 3 inch screen size, but it's a 3:2 aspect ratio screen, which means when viewing a default 4:3 aspect ratio image, not all the screen area is used by the image itself. On the other hand the E-PL2 screen has twice as many dots (460,000) than any of the previous Pens, so it can show more image detail and more refined text. I do find that the stability of the image when changing the viewing angle is not as good as previous Pen screens, though. To make any adjustments to settings on the E-P1 and E-P2 you had the luxury of both a dial and a thumb-wheel. With the E-PL1 these were replaced by cheaper but more fiddly buttons. The E-PL2 goes back to a single dial. The Live Guide image adjustment modes now work with the movie function. 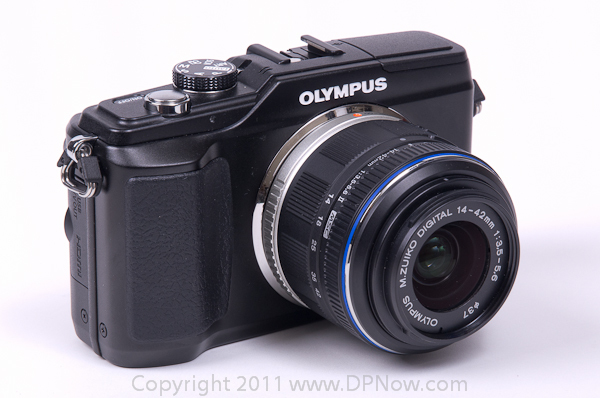 Olympus decided that E-PL1 users could live without a top shutter speed of 1/4000th so it was limited to 1/2000th. This has been returned to 1/400th on the E-PL2, while another frustrating policy of not supporting the RM-UC1 cable release has also thankfully been abandoned. Meanwhile, the face detection system has been enhanced to include eye-detection, which works to ensure that the eyes in a face are the primary focus points. The E-PL1 also lost the top ISO 6400 setting of the E-P1 and E-P2, and this has been restored with the E-PL2, although ISO 100 is now omitted, so the range starts at ISO 200. 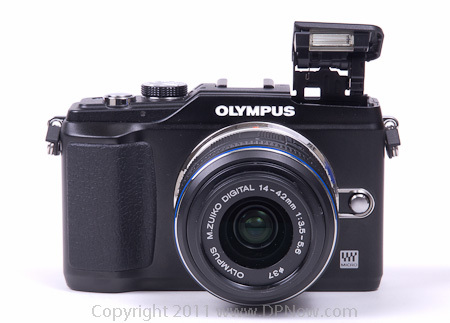 Olympus says the E-PL2 does not replace the E-PL1, at least not for now as the E-PL1 is expected to remain available as the budget price entry point until the summer. Instead, the E-PL2 ushers in some new features and bridges the gap to the more expensive E-P2.